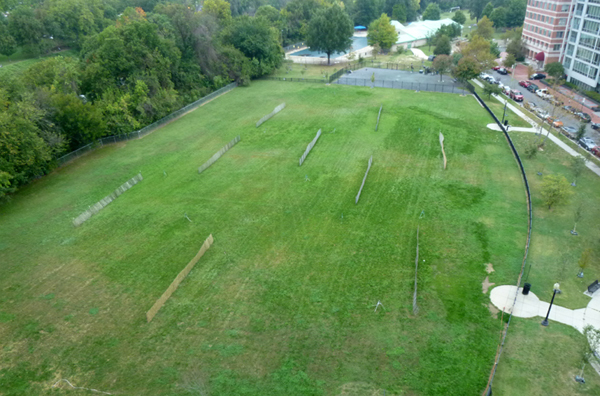 The photo at left was taken on October 11, 2017, after the second seeding and fertilization of our one-year experiment to make Francis Field green after years of overuse and insufficient maintenance. Only grass seed, water, and organic fertilizer were used. No weed-killer or chemicals were applied. 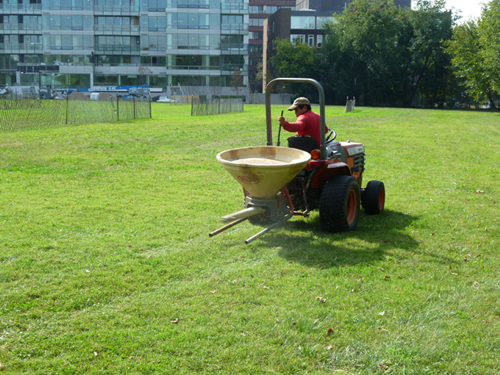 All work has been done with private funds or volunteer labor, under a private-public partnership between Friends of Francis Field (FFF) and the D.C. Department of Parks and Recreation (DPR). More than 300 hours of volunteer time and $23,931 in private, donated funds have been expended on the project since it was authorized by DPR March 1, 2017. 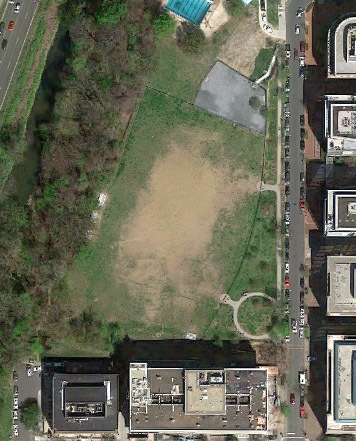 The aerial view of the field at right, taken in 2015, shows the bare-dirt center and the poor condition of the field that had existed before our "greening" project began. It was this condition that FFF's greening experiment was intended to correct. The compacted bare-dirt center, and lack of vegetation also contributed to topsoil runoff into Rock Creek on the west and into the 25th Street storm sewers on the east. The 2017 greening experiment planted two species of grass seed, but also allowed the weeds and native species to continue to grow, rather than killing them with herbicides. This returned the central field to biological life. It prevents water runoff and provides a softer, green playing surface—but not a perfect "country club" lawn. DPR closed the field to permitted and casual play on June 19, 2017, and rows of snow fence (as shown in the photo above) were erected to discourage unpermitted activity and allow the new grass to grow. Germinating the seed in the hot summer, and getting it to grow was complicated by the timetable and the absence of water sources on or near the field. 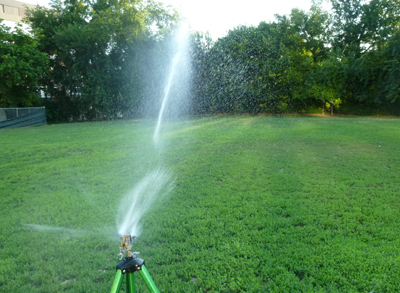 To assure that our seed would have a chance, we devised a system of tripod-mounted sprinklers. A series of these, beginning with five and ending with nine, were rigged up on battery-powered timers. All the water initially came from a single spigot on the outside of the swimming pool. There was not enough water pressure to fire all sprinklers at once. But the timers allowed the job to get done. One of these sprinklers in operation on July 17, 2017, is shown in the photograph at left. Grass was planted on June 26 again on October 6. (The October planting, after much of the June planting was already thriving, is shown in the photo at right.) 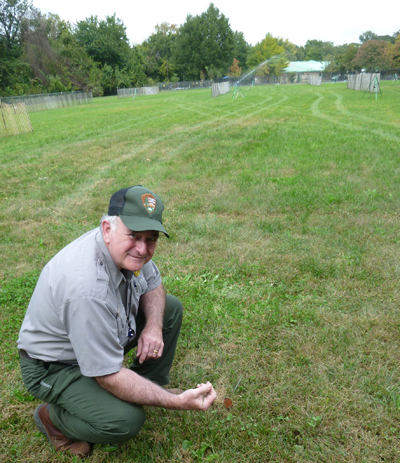 A mixture of Kentucky bluegrass and tall fescue was used. Over the fall and winter, nature has been allowed to take its course. A variety of new and previously planted grass species are currently growing on the field. Most became dormant during the fall and winter months and have turned brown or amber. They should be green again this spring. Also growing on the field are a number of native species, otherwise known as "weeds." About half the field is part of Rock Creek Park, a part of the national park system. Under National Park Service (NPS) guidelines and consultation, no herbicides or poisons were applied during the experimental greening period. Over many years, most of the central field had been compacted by heavy play, keeping grass from growing. At the same time, herbicides were applied to kill weeds. As a result, nothing grew, and the field had large patches of bare dirt, which made school and youth sports play—one of the major uses of the field—dangerous. Shown at left is NPS horticulturist Doug Rowley, examining the field on October 6, 2017, the final day of planting. "Whatever thrives and makes it green is what we're going for," he said. Giving the field time to recover from hard athletic use it gets was also important, Rowley said. "It's a living field. It has to be rested." The field will reopen on March 17, for permitting by DPR. In recent years it has been used increasingly by the School Without Walls, the public high school in Foggy Bottom, which has expanded its athletic programs. Also expanding its programs is the former Francis Junior High School, located nearby, which is now a kindergarten-through-eighth-grade school. It has been renamed "School without Walls at Francis Stevens." For the last twenty years, the District government has paid private contractors to maintain Francis Field and other DPR properties. Photographs of field conditions during that period—see the "Neglect" article—show that those contractors did not keep the field in a safe or pleasant condition. Since at least 2011, those contracts have been issued by the D.C. Department of General Services (DGS), not by DPR. For the coming year, FFF will attempt to monitor the maintenance provided by DGS and its contractors before expending additional private funds to plant grass and fertilize the public field. We will also be studying the ability of the newly greened field to stand up to the athletic and other use that DPR allows on the field. FFF's other plans for 2018 are to raise private funds for making landscaping improvements on the portions of Francis Field that lie outside the central playing area. Please see the separate articles on this website on Grass Planting, Tree Planting, and Irrigation, which are the three parts of our agreement with DPR. Other articles provide background, and can also be found on the navigation pane at left.